You may have noticed that Ubisoft has been giving away quite a few freebie PC games in recent times, and here’s another in the form of For Honor. 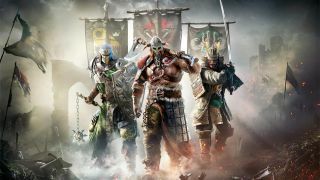 Yes, you can get For Honor for the price of absolutely nothing – albeit the Starter Edition of the game – if you head on over to Uplay. The offer is live now, and will run through until June 18 (so basically for the remainder of E3 week). If you’re not familiar with it, For Honor is a hack-and-slash combat fest that pits the likes of Samurai against Vikings and medieval knights, but if that description makes you think the game is a brainless brawler, the truth is far from that. In actual fact, it offers surprisingly in-depth fighting action, and it’s well worth checking out, particularly now you don’t have to pay for the privilege. The Starter Edition is somewhat limited in scope, as the name suggests, with less content than the full game (i.e. Standard Edition or better). But it would still normally cost £12.49 (around $17, AU$22) and gives players access to all modes and maps, and six heroes to choose from (with others that can be unlocked by spending in-game currency, although you can earn that by playing if you want to go the true ‘no-pay’ route). Incidentally, the other versions of the game have had their prices slashed by 75% on PC, meaning that the Standard Edition is now £12.50 (around $17, AU$22) instead of £50 (around $65, AU$90). Lesser reductions have also been applied to the console spins on the game. This freebie coincides with the revelation of a fresh update for the game at E3, which goes by the name of Marching Fire, and adds a fourth faction, four new heroes, along with a pair of new play modes for PVP and PVE, among other goodies. If you like gritty and deep combat games, this is worth checking out, particularly seeing as the online matchmaking problems which were initially criticized in some quarters have been solved in a previous update which added dedicated servers. Don’t forget that it’s currently PC Gaming Week at TechRadar and we’ve got a load of top-notch content to spoil you with, including a look at how to become a professional esports player, and a roundup of the best PC games of the year so far, among many other articles.